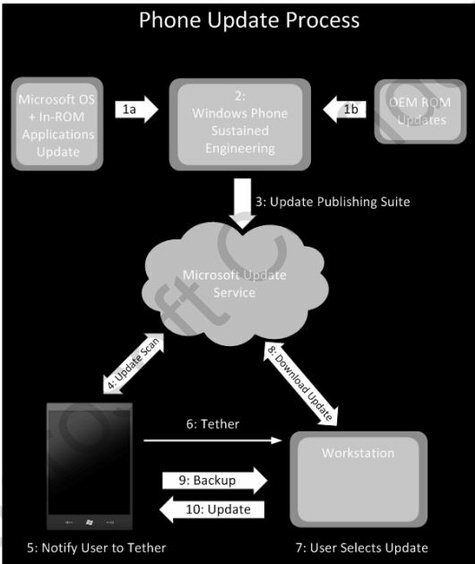 In a leaked document, evidently found by Tweakers.net, some more information has emerged on the internal design, some limitations and drivers in Windows Phone 7. Most the information seems to work in favor of a stable, consistent and consumer friendly mobile OS, but one cannot deny the big role Microsoft is now playing in overseeing their new OS (though it's still much less than Apple's grip on the iPhone and iPad, but is that really saying much?). Other details related to the memory architecture, which is more or less interesting for programmers and the tech savy. In short, it's a 32-bit OS with a dual layer architecture. The kernel and application processes are allowed 2GB of memory each and programs are allowed 1GB of virtual memory (up from a measly 32MB in WM6.x). The file systems are based IMGFS for system files, and TexFAT for user files, with the later being "...best suited for non-removable media, such as NAND and NOR flash memory". Overall the news is a bit mixed, though we're a bit happy Microsoft is putting the handcuffs on carriers, especially regarding the addition of their own software/services and blocking the addition of trial-ware. Likewise for ROM updates, which will now be centralized. However, we're a bit worried about the 2D/3D driver situation as that has been a problem in the past. What say you? Read the original article here (Google Translated).